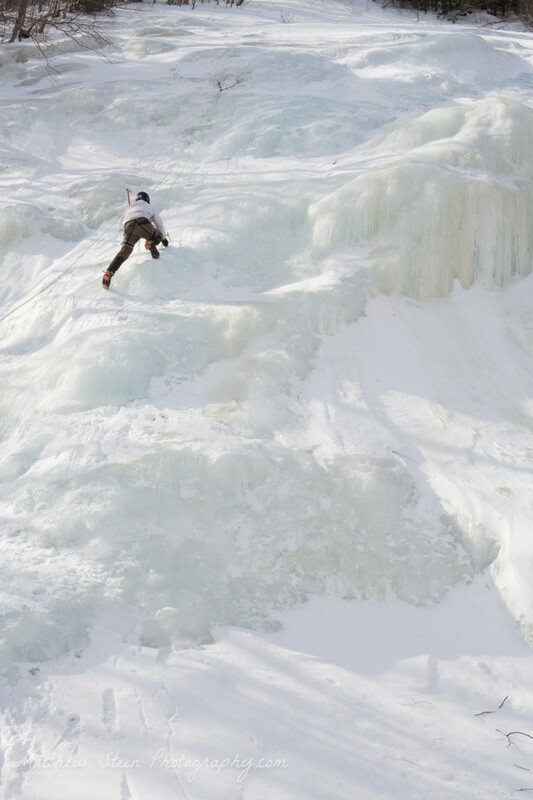 I never wanted to go ice climbing. 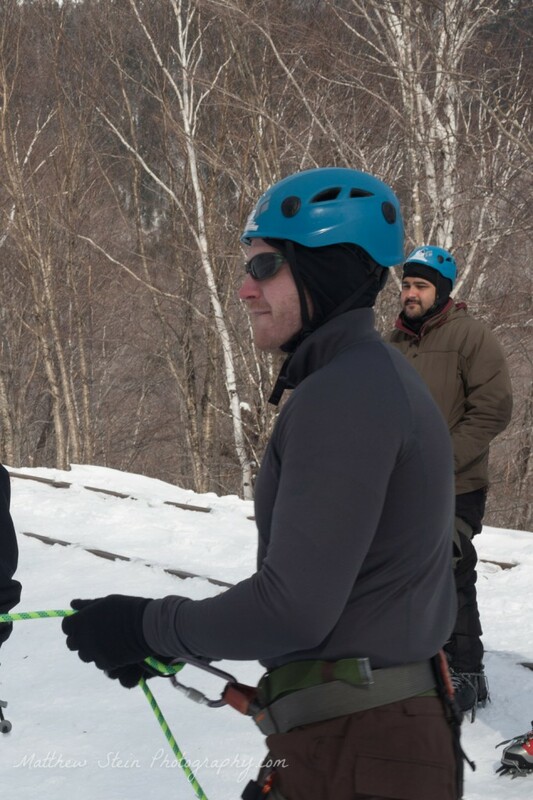 Sitting there on belay, waiting for someone else to move slowly up a wall of ice. I'm getting cold just writing this. Then the idea started to grow on me. 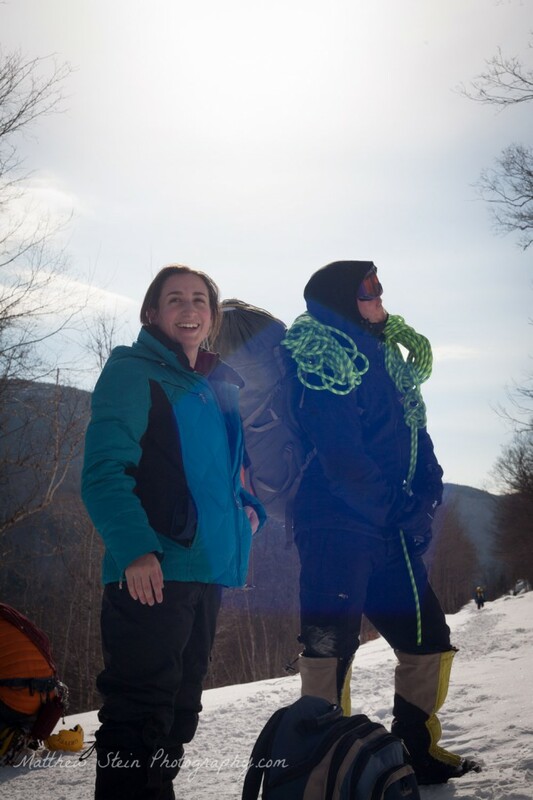 First, while climbing a ridge line to snowboard in the backcountry. Then I hiked Mt Washington a few times last year. Once in freezing hurricane conditions, another starting at midnight just to summit at dawn. 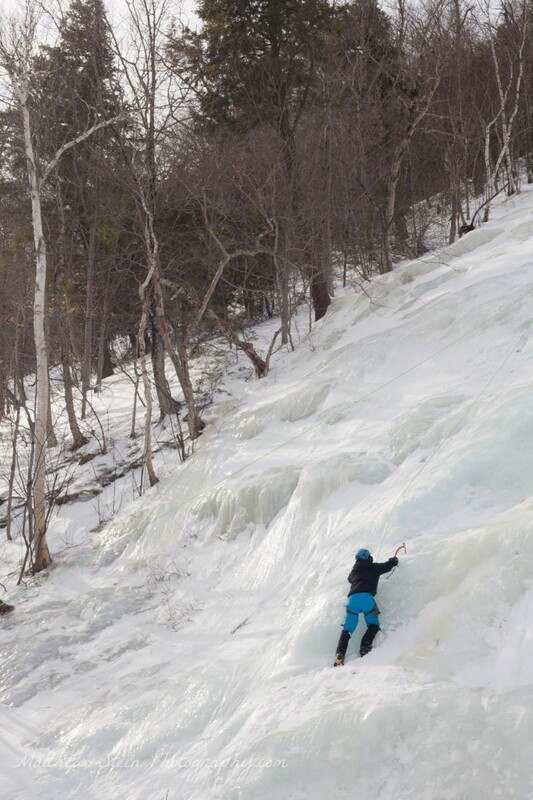 After that, ice climbing starts to seem like a reasonable next step. Different terrain offers different challenges. Learning to survive various conditions is part of the fun. Generally, I believe survival should precede shooting somewhere. I've spent plenty of time on rocks. It's time to stop ice from standing in my way to the top. 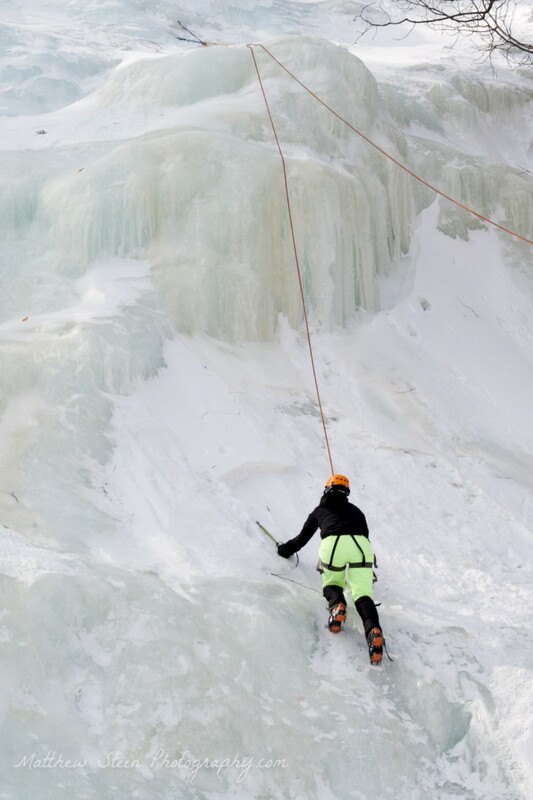 Like too many of my hobbies, ice climbing is whole new level of gear commitment. Ice tools and crampons are rentable. Most of my snowboarding layers are warm enough. The right clothes definitely help. 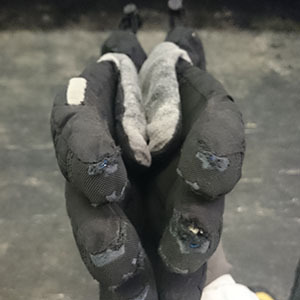 Some people like mittens, I prefer gloves. Good gloves too, especially since I'm operating a camera. These North Face's have served me well for a few years. 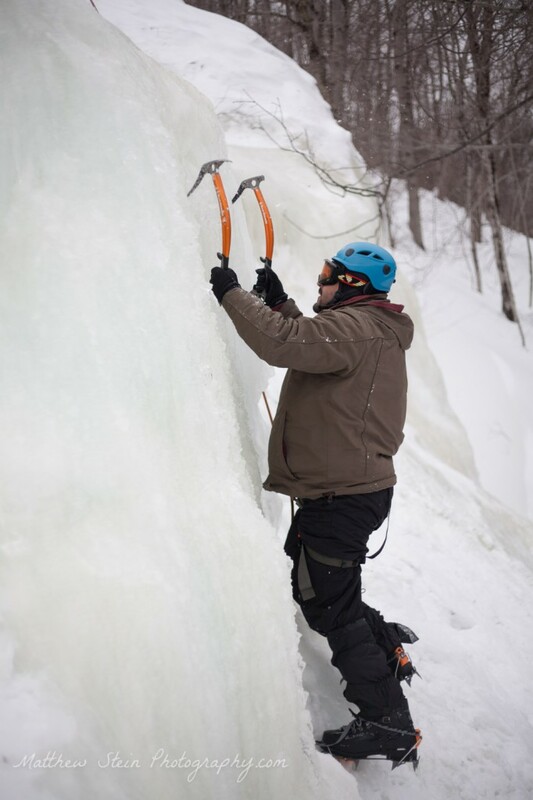 What's the difference between an ice axe and ice tools? An ice axe is like a walking stick. It's great for general purpose mountaineering. Ice tools are more curved, with molded grips. 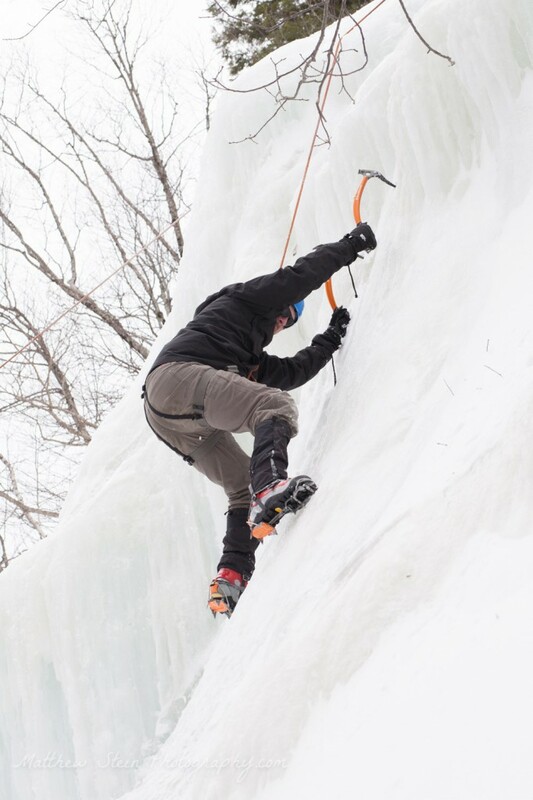 The more vertical the ice you're climbing, the more aggressive curve you want on your tools. Boots. I tried to break 'em in. It felt like they were breaking in my ankles. My EVO's are heavy, and they have a super stiff shank (sole.) It's completely rigid. 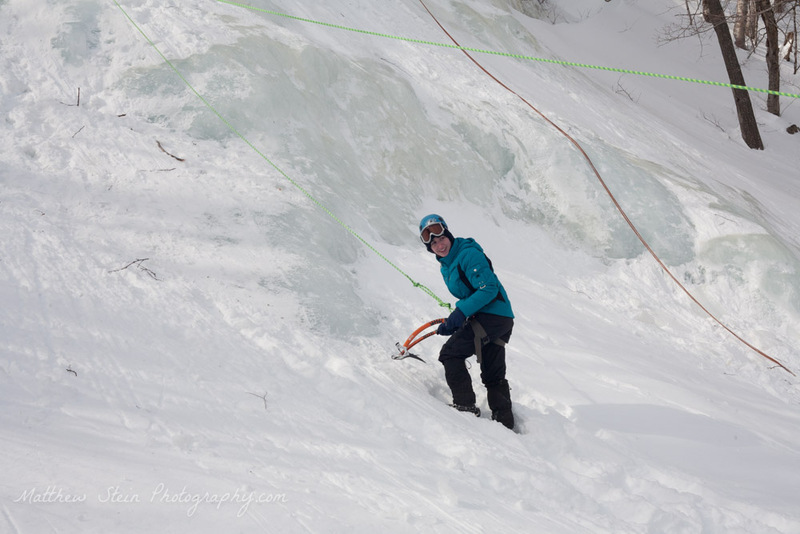 When I'm kicking into the wall with crampons for a foot hold, I don't want them wiggling or shifting under my foot. These were rock solid. Walking in this Boston winter gave me the opportunity to get used to them. 4:15am. Not a pretty time. We piled into the car and head north. Thanks Sam for driving. 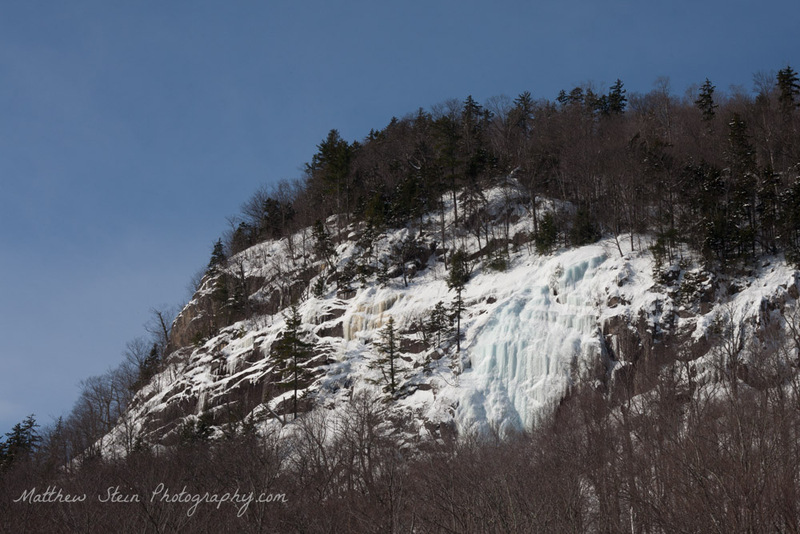 Frankenstein wall is in the New Hampshire White Mountains. 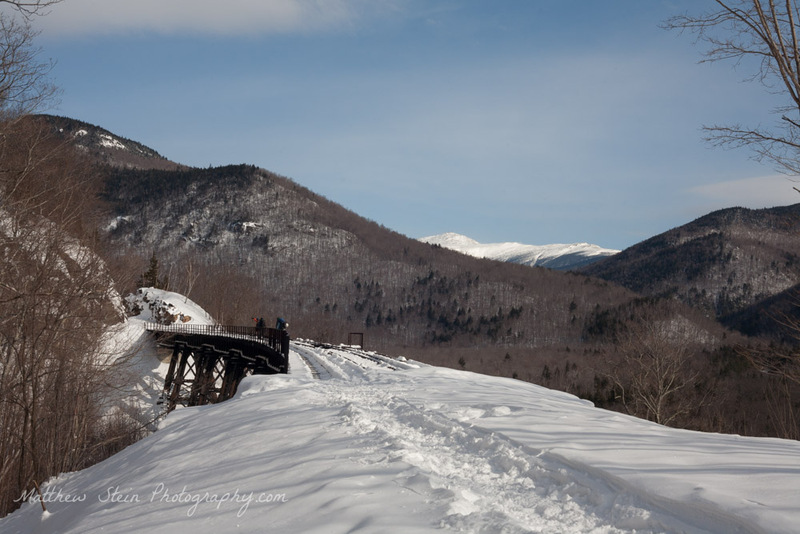 Near Crawford Notch off route 302. 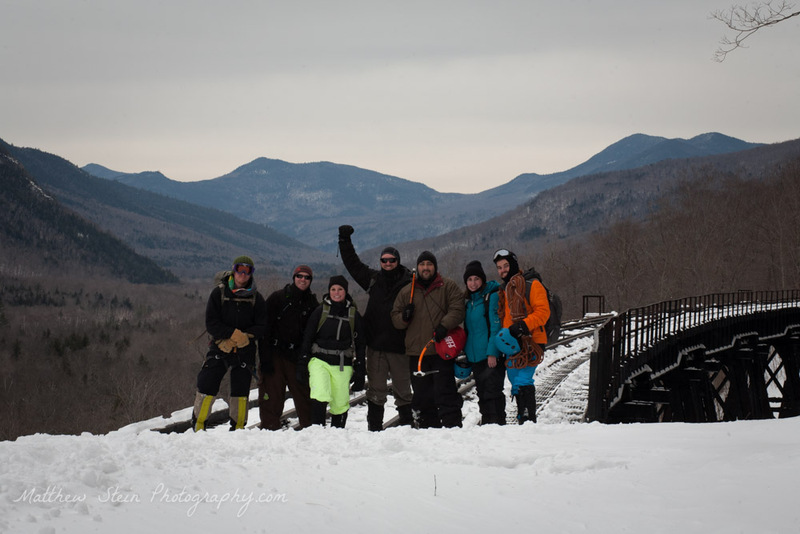 There's a short hike up to a railway line, and a mile or so down the trestle. We passed classic climbs like The Standard Route and got a clear view from the tracks at the amphitheater. We spied the summit of Mount Washington crystal clear, just a few miles away. Climbing is a lot of work. I wasn't cold. There were still more surprises on the wall. The same water that runs over these rocks freezing into beautiful shapes also runs below the ice. It doesn't stop just because of a little ice, it runs deeper. A few times I'd go to stab an ice tool into the wall, and I'd hit a gusher. Ice cold water emerges, sometimes spurting out, sometimes just a small flow. Fortunately I was covered head to toe in waterproof gear, so I didn't get wet. How does one tell if the ice is safe? Will it hold? I started to get a feel for that after climbing a few pitches. Sometimes there's a thin layer of ice on top of snow. It cracks like a glass plate, shattering with each strike only to slide and fall down the cliff. That's why you never belay from directly beneath the climber. 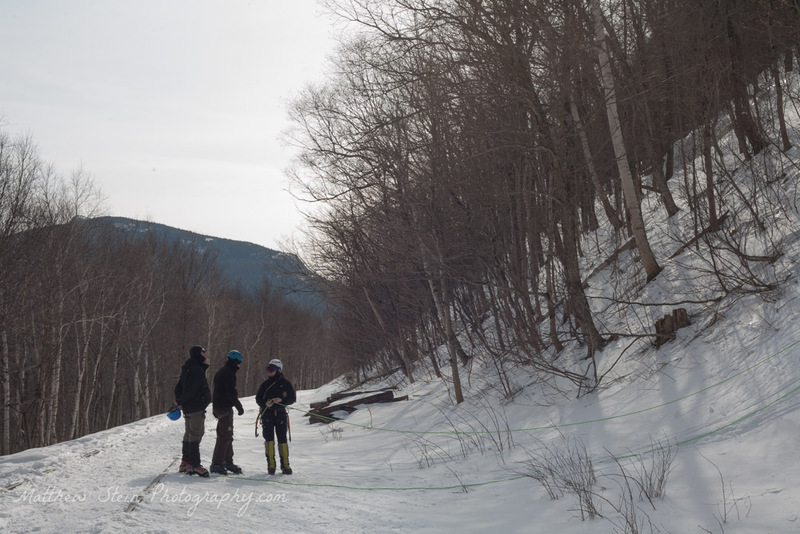 We marked out a space downhill from the climbing area. It was an area of danger. Not served by a highway, but more a railway. It was the railway to the danger zone. Shooting is a fun challenge. The easiest shot is from below, up towards the person on the wall. Those are the spectator seats, but its still more than most people will ever see in person. On this wall I had access on the right and left of the ice we were climbing. Snow fields with a few trees bookended our wall. They made for relatively easy scrambling. Packing the snow down properly, I made myself a little seat. The real dramatic shots are when a climber is leading and above their protection. We didn't do any leading this time. For most of us it was our first or second time on ice, so we top roped everything. We set up two ropes for the day. In the afternoon I shot from one, while our group climbed the other. If it doesn't look very steep, try it sometime. I can't wait to try this again. 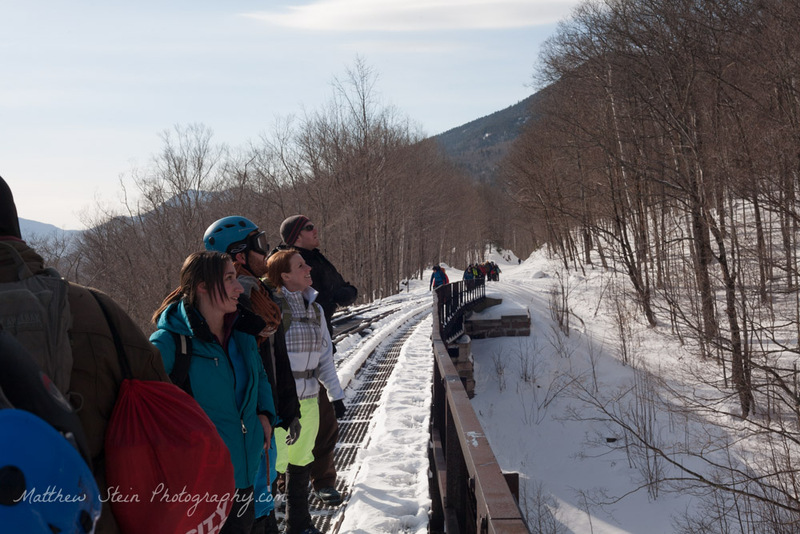 Over the rail trestle, you get a great view of many climbs. They call this the amphitheater, a wide selection of choices. 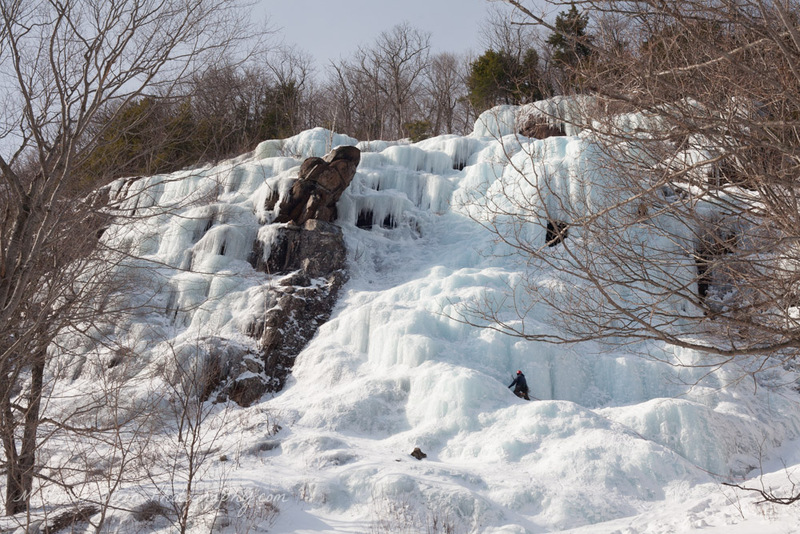 Thick ice this season, 2015. The Standard Route. Sarah assessing the climb for the day. 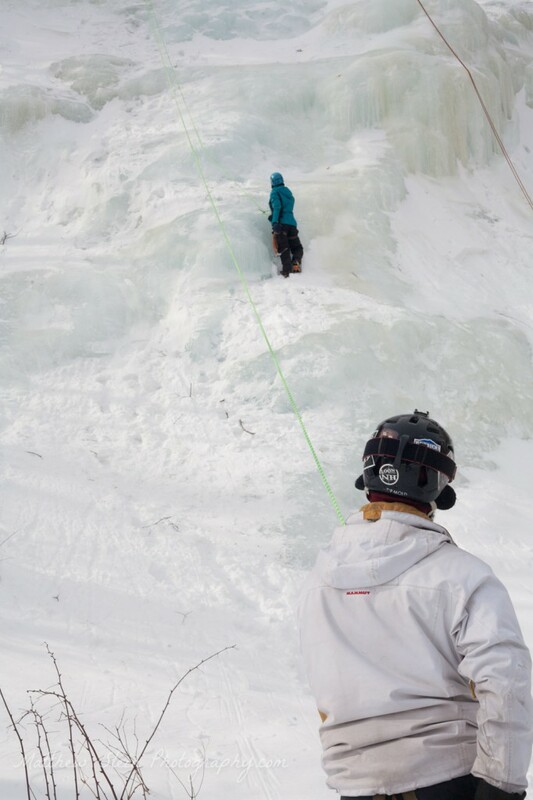 This was my first ever Ice Climb. Mike Ewing getting over the lip. Heading back after a good day at the wall. Mike Ewing approving the day.